Without intending to, we spent much of last weekend looking at various kinds of monumental art, and I thought it might make a nice change from my holiday diary (thankfully there’s only Vancouver left to go!). Friday night saw us at the Morgan Library for an ‘in conversation’ event to mark the opening of a new installation by the artist Spencer Finch. 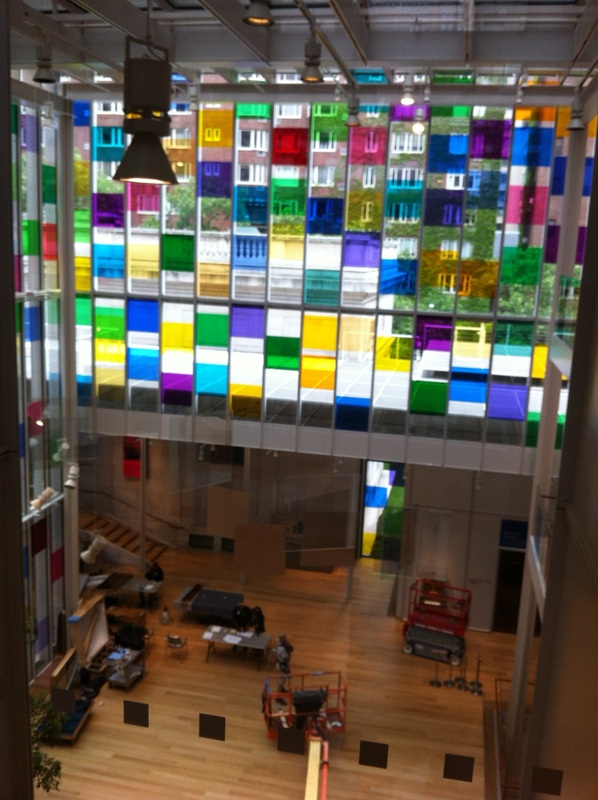 The piece A certain slant of light turns the atrium of the Morgan’s building into a kind of kaleidoscope – each of the four walls represents a season, and has coloured panels reminiscent of the seasonal illuminations in Books of Hours. Various red panels indicate ‘red letter days’ for Finch, and are placed appropriately within the four seasons. In addition to discussing this work he also talked about his early career, and a number of his other pieces, and the time really flew by – he was an interesting and entertaining speaker, and it was fascinating to hear about the thought processes behind this abstract art. I don’t actually have any pictures of the finished work, but this is one I snapped whilst it was being installed – apologies for poor-quality phone pic. On Saturday it was off to Astoria and the Noguchi Museum. Another abstract artist, Noguchi worked predominantly with hefty pieces of rock (marble, granite), sometimes crafting and polishing them but also leaving surfaces in a more original state. He also produced smaller sculptures which I found very reminiscent of the work of Constantin Brancusi (and I was subsequently very satisfied to discover that Noguchi studied with Brancusi as a young artist in Paris). 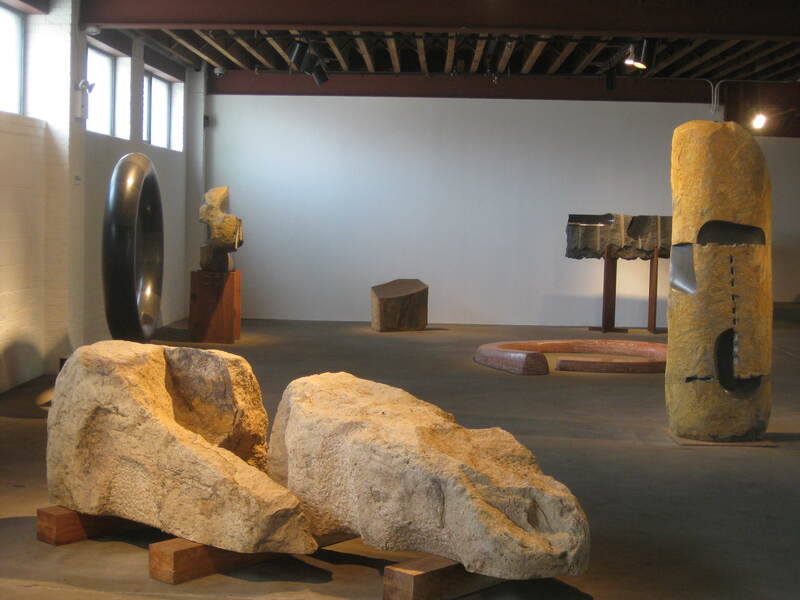 The museum is located in his old studio, and some of it preserves how the artworks were set out by Noguchi himself. He was apparently not a fan of art gallery labels, so instead each gallery has an information sheet which you can pick up to refer to (or not) as you look around. Then on Sunday we went up to the Cathedral of St John the Divine to see the Phoenix and go to evensong. 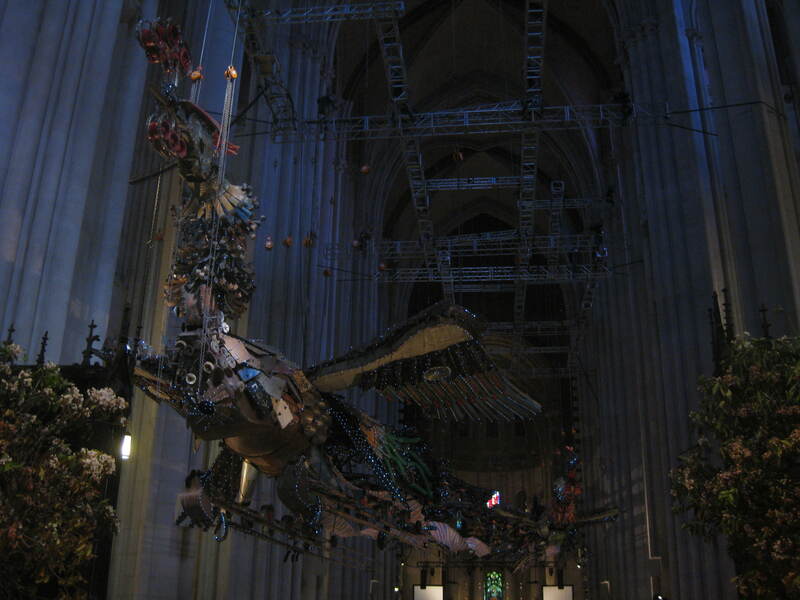 Created by the Chinese artist Xu Bing, this installation consists of two massive phoenixes made from scrap and found objects. Tom really likes this cathedral, I think it’s dark and oppressive, but we both agreed that the two enormous pieces looked oddly at home in their rather splendid setting. This entry was posted in Museums/galleries, Uncategorized and tagged Isamu Noguchi, Morgan Library, Spencer Finch, St John the Divine, Xu Bing by Emma Davidson. Bookmark the permalink.